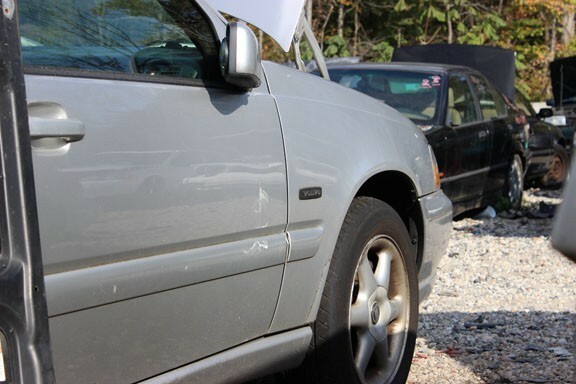 10 Tell-Tale Signs Your Used Car Has Been in an Accident - With Pictures. Right now, the new and used car market is seeing a huge upturn in sales. With the economy on the mend, and the average age of cars on the road nearly 12 years old, the demand for replacement vehicles is at a record high. With the sale of new cars typically comes an infusion of used cars. Perhaps you are shopping for one now. If you are, then you should use this is as your guide. Now I know what you may be thinking: Carfax and a few other companies can print out a report for you for a mild fee that will tell you of any history of car accidents. Well, as nice and convenient as that is, that information comes from several sources, such as police incident data and some insurance claim data. 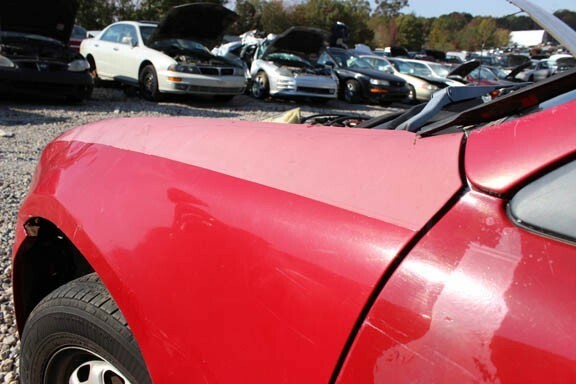 If the owner had any work done and paid out of pocket, or if it was cleaned up prior to an auction or dealership sale, this information will not show up on a CarFax report. Luckily, our list was compiled by real auto body repair shops. If anybody knows what to look for if a car has had repairs done on it, it is auto body shop repairers. The longevity of any auto body repair is dependent on the preparation. Many times, a shop fails to properly sand a panel with enough fine grits of sandpaper, and when painted, the sanding marks show through. These will look like fine scratches buried under the paint. If you look closely in the example above in the orange circle section, you can see the cross hatching from sanding marks. This is caused when a car goes into the paint booth before the primer coat has been properly sanded. All finished cars have some degree of “orange peel”. This happens when paint droplets hit the car surface at high velocity from the paint gun. Orange peel can still look shiny, but really bad orange peel will look dull or even foggy if you look down the panel. When checking a used car, look down all the panels, get on your hands and knees and look closely at them. What you want to see is the same paint texture on every single panel? Any variances from one panel to the next could indicate a repainting? 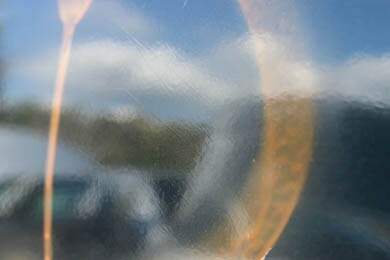 In this particular example above, you can see the really deep orange peel in the reflections. This is NOT factory paint; it is not even a decent body shop paint job. Whatever shop did this work was not very good. Check each wheel well opening, and along the edges of doors, hoods and fenders. 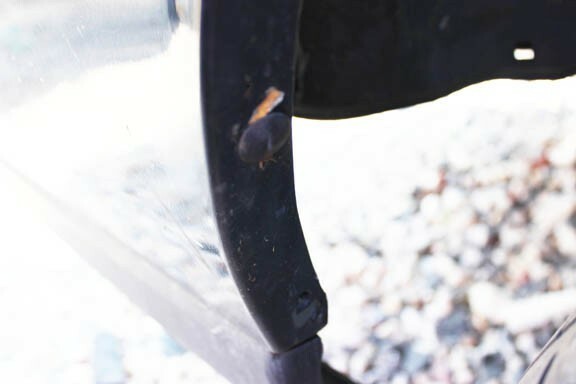 A rushed body work job will sometimes leave traces of caked-on, un-sanded auto body filler in these areas (especially since they are not seen while standing up, looking at the car). This is an extreme example of un-sanded body filler that I found in a junk yard. But this gives you an idea of where to look for un-sanded body filler. Since these areas aren’t typically seen, they are often missed by a body shop looking to move cars through the system quickly. When putting a car back together, screws get lost, omitted and sometimes clips and fasteners get broken or lost. If a panel had four fastener, you can still put it back on the car with three, and a body man in a hurry might take this shortcut rather than waiting for another shipment from the parts store to make another delivery. It is a little hard to tell in this photo, but this Honda bumper is supposed to have four plastic fasteners to hold it to the quarter panel. Instead, it only has two. When cars are built at the factory, the special tooling involved does not mar the paint on the bolts. 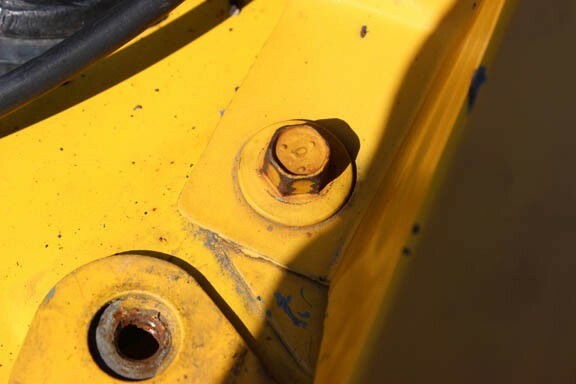 Shown in the picture below is a bolt on a fender that had been repainted. You can clearly see how water and rain caused the chipped bolt heads to start rusting. This is a dead giveaway that this fender has been repaired at some point. This fender bolt has clearly been touched when auto body work was done long ago. The bolt has started rusting where the paint is chipped. You won’t be able to tell this as much from a quality auto body shop as you would from a shop that does shoddy work, but inspect all of your door gaps, hood and trunk seams to see if they are even on both sides. If a panel is higher than the other, or perhaps a hood is closer to the fender on one side than the other, there is a good chance this car was repaired in the past. A trained eye can easily spot this, even if the car is driving in traffic. What you are looking for is a panel where the paint doesn't quite match all along it (or even the other panels). Staring straight at it won’t always give it away but look at all the panels, (doors, trunks, hoods) and look for any inconsistencies in the paint finish. If your paint is metallic, look for abnormalities in the “grain” of the metallic flake in the panel. 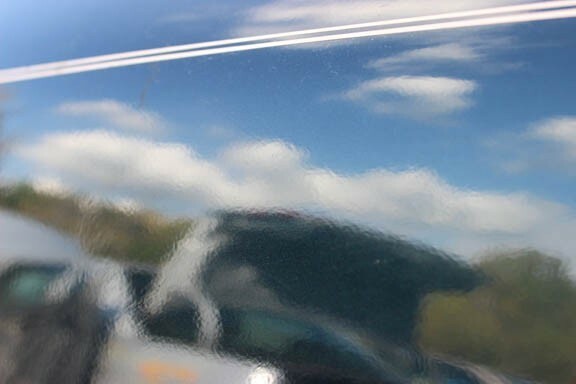 When body shops repair panels, one technique is to blend new paint into the old paint for a seamless finish in the middle of it. However, this takes incredible painting skills and patience, and not every production auto body repair shop has either. 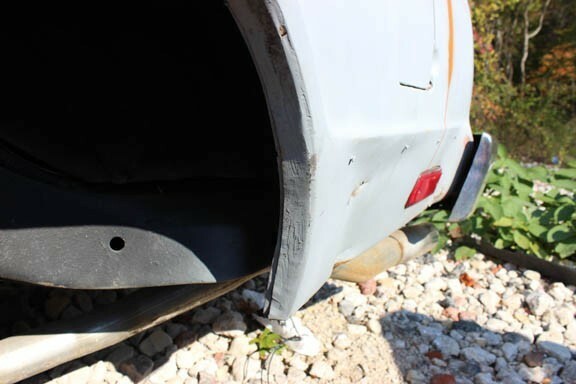 This fender, as photographed in a junkyard, has been painted in the past, but only on the bottom section, and the door next to it. You can see how the painter masked off the body at the reveal line and only painted the repaired section below. Over time, the two paint finishes aged at different rates, and the old original finish faded a lot faster than the newer paint. This is a dead giveaway. Modern headlights dull and get cloudy over time. The sun’s UV rays degrade the plastic covers, and the sand and other debris in the air acts like a sandblaster, constantly scratching the surface. If a car has been in an accident on one side and needs a headlight, the insurance company is only going to replace the bad headlight. So if a car is ten years old and gets in an accident at year 6, one headlight will be ten years old, the other will only be four years old. Good auto body shops will buff the other headlight to match, but they don’t always get paid to do it. As time goes by, the original headlight will get cloudy at a much faster rate than the newer one. 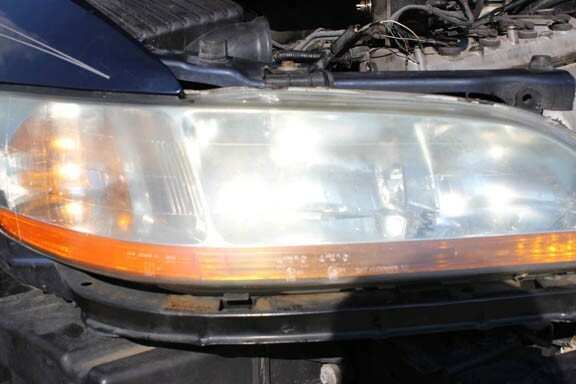 So any time you see a clearish headlight and a cloudy headlight, start looking for other evidence of prior damage on the side with the clearer headlight. When cars get repainted, they get repainted in body shops that are full of dust. Even the best shops in the world have dust issues to deal with. Really great shops go to extreme lengths to keep their paint booths dust free. Some even have separate buildings just for painting, but even your average production shop has tools at their disposal to keep dust at bay. Every once in a while, dust or dirt still sneaks into a panel or two. Most shops will simply lightly sand the clear coat and buff it back to shiny. Sometimes a dirt particle or two gets missed, or the shop just did a shoddy paint and prep job. Either way, if you see small specks in your paint that are raised up slightly higher than the rest of the finish, you can bet that the car has been repainted (at least on that panel). All cars come with a paint formulation code. Modern paint shops have computerized paint mixing equipment in their shops. They simply enter the paint code and the system mixes the paint. Should be a dead on match then, right? Not really. There are variances in shades of that color code. The car manufacturers will allow three variances, and depending on where your car was built, there could be a variance between an east-coast-built-car and a west-coast-built-car. The difference in color will be minor, but in the right light, it’ll be very noticeable. Also, older paint fades slightly from UV rays, and to get a true perfect paint match, you would need to paint the whole car. Good shops will do a technique where they spray slightly differing tints of the same color so to find the one that matches your car perfectly. Yet, to the trained eye, you can often still spot the difference. When shopping for a used car, look at the car from all angles and in varying lighting conditions. You might just spot some paint work. Although it might be hard to spot in the photo, the fender on this Volvo has been repainted and is a lighter shade than the surrounding body work. Look at where the door meets the fender near the top section. Can you see the difference? There are a lot of articles about spotting auto body work, and most guides simply tell you what to look for. 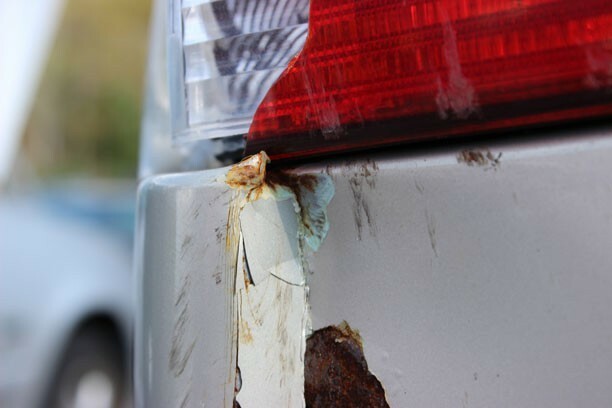 Hopefully this guide has given you a better, more in-depth, pictoral lesson in how to tell if your used car has had body work, before you buy it.